For other uses, see Blackboard (disambiguation). "Chalkboard" redirects here. For other uses, see Chalkboard (disambiguation). A blackboard can simply be a board painted with matte dark paint (usually black, occasionally dark green). Matte black plastic sign material (known as ‘closed-cell PVC foamboard’) is also used to create custom chalkboard art. A more modern variation consists of a coiled sheet of plastic drawn across two parallel rollers, which can be scrolled to create additional writing space while saving what has been written. The highest grade blackboards are made of a rougher version porcelain enamelled steel (black, green, blue or sometimes other colours). Porcelain is very hard wearing and blackboards made of porcelain usually last 10–20 years in intensive use. Manufacturing of slate blackboards began by the 1840s. Green chalkboards, generally made of porcelain enamel on a steel base, first appeared in the 1960s. Lecture theatres may contain a number of blackboards in a grid arrangement. The lecturer then moves boards into reach for writing and then moves them out of reach, allowing a large amount of material to be shown simultaneously. The chalk marks can be easily wiped off with a damp cloth, a sponge or a special blackboard eraser usually consisting of a block of wood covered by a felt pad. However, chalk marks made on some types of wet blackboard can be difficult to remove. Blackboard manufacturers often advise that a new or newly resurfaced blackboard be completely covered using the side of a stick of chalk and then that chalk brushed off as normal to prepare it for use. Sticks of processed ‘chalk’ are produced especially for use with blackboards in white and also in various colours. White chalk sticks are made mainly from calcium carbonate derived from mineral chalk rock or limestone, while colored or pastel chalks are made from calcium sulfate in its dihydrate form, CaSO4·2H2O, derived from gypsum. Chalk sticks containing calcium carbonate typically contain 40–60% of CaCO3 (calcite). Chalk requires no special care; whiteboard markers must be capped or else they will dry out. Chalk is an order of magnitude cheaper than whiteboard markers for a comparable amount of writing. It is easier to draw lines of different weights and thicknesses with chalk than with whiteboard markers. Dashed lines can be drawn very quickly using a technique involving the friction of the chalk (or chalk marker) and blackboard. Chalk has a mild smell, whereas whiteboard markers often have a pungent odor. Chalk can be easily erased; writing which has been left on a whiteboard for a prolonged period may require a solvent to remove. Chalk can be easily removed from most clothing; whiteboard markers often permanently stain fabric, wood (wood frame), etc..
Chalk is mostly biodegradable, whereas most plastic recyclers will not take whiteboard markers. On the other hand, chalk produces dust, the amount depending on the quality of chalk used. Some people find this uncomfortable or may be allergic to it, and according to the American Academy of Allergy, Asthma and Immunology (AAAAI), there are links between chalk dust and allergy and asthma problems. The dust also precludes the use of chalk in areas shared with dust-sensitive equipment such as computers. The writing on blackboards is difficult to read in the dark. Chalk sticks shrink through use, and are notorious for breaking in half unless inserted in a writing utensil designed for chalk. The scratching of fingernails on a blackboard, as well as other pointed, especially metal objects against blackboards, produces a sound that is well known for being extremely irritating to most people. According to a study run by Michael Oehler, a professor at the University of Media and Communication in Cologne, Germany, humans are "predisposed to detest" the sound of nails on a blackboard. The findings of the study were presented at the Acoustical Society of America conference and support earlier findings from a 1986 study by Vanderbilt psychologist Randolph Blake and two colleagues found that the sound of nails on a chalkboard annoyed people even when the high-pitch frequencies were removed. The study earned Blake a 2006 Ig Nobel Prize. The first classroom uses of large blackboards are difficult to date, but they were used for music education and composition in Europe as far back as the sixteenth century. The term ‘blackboard’ is attested in English from the mid-eighteenth century; the Oxford English Dictionary provides a citation from 1739, to write “with Chalk on a black-Board”. The first attested use of chalk on blackboard in the United States dates to September 21, 1801, in a lecture course in mathematics given by George Baron. James Pillans has been credited with the invention of coloured chalk (1814): he had a recipe with ground chalk, dyes and porridge. The use of blackboard did change methods of education and testing, as found in the Conic Sections Rebellion of 1830 in Yale. ^ "How chalk is made – material, making, used, processing, procedure, product, industry". www.madehow.com. Retrieved 31 March 2018. ^ Corazza, M., Zauli, S., Pagnoni, A. and Virgili, A., 2012. Allergic contact dermatitis caused by metals in blackboard chalk: a case report. Acta dermato-venereologica, 92(4), pp.436–437. ^ WebMD. "Reading, Writing, and Wheezing? Not Necessarily". Asthma Health Center. WebMD. ^ Robert Siegel (9 November 2011). "Why Nails On A Chalkboard Drives Us Crazy". NPR. Retrieved 31 May 2016. ^ Frances Romero (14 June 2010). "Top 10 Most Annoying Sounds: Nails on a Chalkboard". TIME Magazine. Retrieved 31 May 2016. ^ "Full text of "Alberuni's India. An account of the religion, philosophy, literature, geography, chronology, astronomy, customs, laws and astrology of India about A.D. 1030"". ^ Owens, Jessie Ann. Composers at Work: The Craft of Musical Composition, 1450-1600. Oxford University Press, 1998. ^ Stephen E. Ambrose (1 December 1999). Duty, Honour, Country: A History of West Point. JHU Press. p. 19. ISBN 978-0-8018-6293-9. Retrieved 14 February 2013. ^ Jo Swinnerton (30 September 2005). The History of Britain Companion. Anova Books. p. 128. ISBN 978-1-86105-914-7. Retrieved 14 February 2013. Look up blackboard or chalkboard in Wiktionary, the free dictionary. 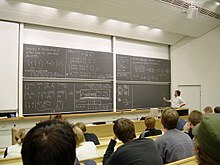 Wikimedia Commons has media related to Blackboards. Ansell, Ben W. (2010). From the Ballot to the Blackboard: The Redistributive Political Economy of Education. New York City: Cambridge University Press. ISBN 9781107616998. OCLC 876849496.